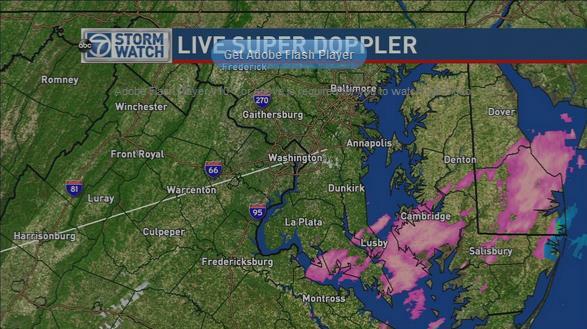 WASHINGTON -- Freezing rain is moving out of the D.C. area after causing some major traffic delays Tuesday morning. Anne Arundel and Prince George's counties felt the brunt of the weather system. A winter weather advisory is in effect Calvert and St Marys counties until 11 a.m. Some rain, drizzle and sleet came through the area Tuesday morning, which caused some slick roads. Wet, slick roads led to some accidents overnight, especially on ramps and overpasses. By mid-morning, the region will climb above freezing and get to the 40s later in the day. The rest of the day will be breezy with peeks of sunshine in the afternoon. The windy conditions will help dry off the roadways, which will help with road conditions. Slick roads caused major delays earlier Tuesday -- particularly in Prince George's and Anne Arundel counties. The toughest spot during the morning was Route 50 in Maryland, says WTOP Traffic's Jack Taylor. 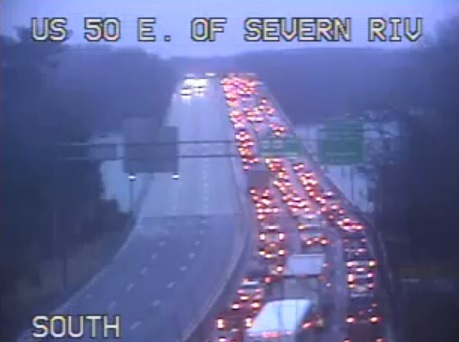 Earlier Tuesday morning, all lanes were blocked on westbound U.S. 50 on the Severn River as well as at U.S. 50 at Md. 3/U.S. 301 in Bowie. All lanes have reopened, but delays persist. Follow @WTOPTraffic on Twitter for the latest updates. Some area schools issued delays and closures Tuesday morning. Get the full list on WTOP's Closings and Delays page.